To make the dough, combine the flours, add the Oil mix well till well incorporated now add Salt,Methi leaves and Cilantro (Coriander Leaves). Add in the Yogurt/Spice mixture and make dough. Once the fours come together in dough, knead for a few minutes. Cover and allow the dough to rest for 20- 25 minutes. Divide the dough and make equal balls. Sprinkle some Whole Wheat Flour and start rolling it on a flat surface. use more wheat flower while rolling as needed and make chapati size. shift it on to tava and keep moving the Thepla a little so it does not stick and the allow it to cook on the underside till its well done. Flip the Thepla and allow it to cool on the other side. Drizzle Oil, spread it and flip it. Press down gently but firmly with a flat spatula, pressing and turning as you go. Apply Oil on this side as well and flip and press down again. Take off the tawa and Serve immediately with pickle or yogurt. I love this recipe. It came out really tasty. 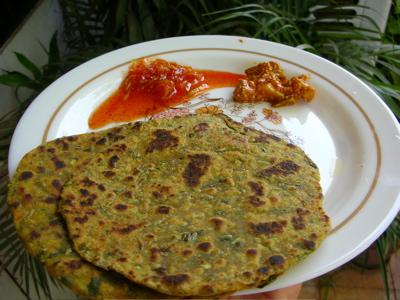 methi theplas are my favorite. thanks for posting such yummy recipes. You tube, "show me the curry .com" is quite good to take recipes from.